The "screen" wall shielding the entrance to the galleries. 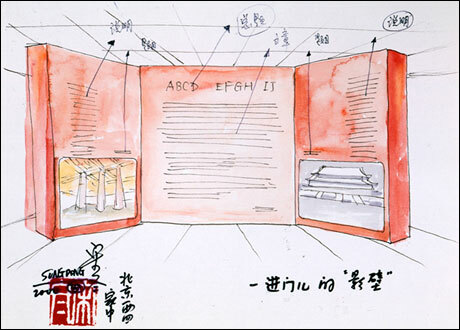 Song Dong's sketches for the design of Canceled: Exhibiting Experimental Art in China in the Smart Museum of Art, University of Chicago, ink and watercolor on paper, 2000. 10 3/16 in. x 7 1/4 in. (25.9 cm x 18.4 cm). ©2002 The University of Chicago.